Traditional two story executive custom home totally redone in 2014 with the best of everything offering expansive views of the golf course and lake. This immaculately maintained home offers a formal living room, formal dining room, family room with fireplace, built-in entertainment wall, sonos music system throughout, wine room, office /study with built in cabinetry, an open kitchen with center island, spacious walk in pantry, breakfast bar and breakfast room. Exquisite master bedroom suite located on the first floor with sitting area and extra-large custom walk in closets. Master bath with marble floors, walk in shower, tub, and sit down vanity. There is also a guest bedroom suite on the first floor. Second floor offers 2 additional guest bedroom suites, spacious media room and open balcony overlooking the golf course and lake. Enjoy panoramic golf course views and lake views as you step onto the expansive screened lanai with heated pool, raised spa, spacious dining areas. Exquisitely spacious heated pool/ spa home with cascading waterfall & outdoor kitchen. 3-bed(all with en suite), 5-bath, oversized game room w/ built-in bar, 3-car garage. Located just next to the #1 situated on one of the larger estate lots in renaissance. The house sprawls across 4,916 sf living area & 9,719 sf of ttl area. Timeless style & casual elegance. Features include spacious living room with coffer ceilings, custom built-in entertainment unit. Open designer kitchen with huge breakfast bar, viking cook-top, dual ovens, & microwave & lots of natural light. The master retreat offers private balcony, en-suite includes walk-in closets with built-ins, dual vanities & deep soaking tub plus huge shower with dual glass door entry. Flooring includes hard wood with inlays, tile and carpet floorings. Crown molding and volume ceilings throughout. All windows and doors are hurricane rated, steel frame construction, generator (propane). 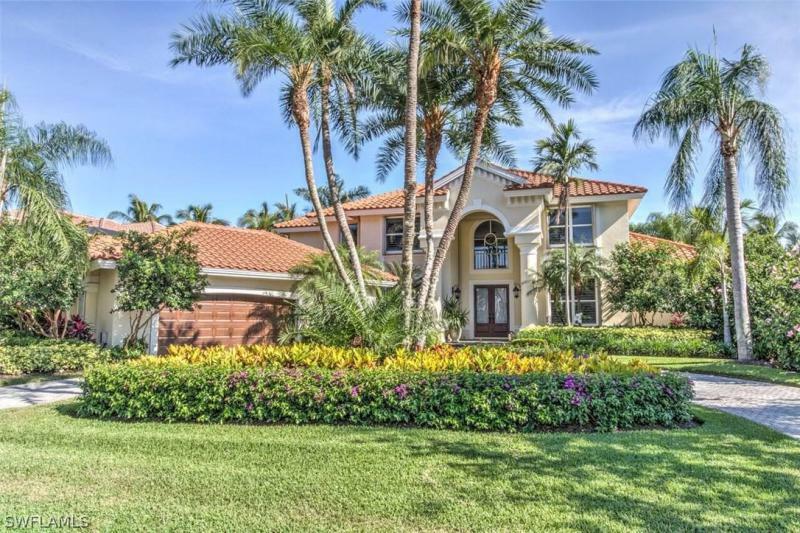 Large attic area with stair access-situated in one of south fort myers most sought-after gated private golf communities offering world-class golf, tennis, state-of-the-art fitness facilities, restaurant and clubhouse. Hoa fees apply. Seller motivated. Bring offers!the paramount is most prestigious building in gulf harbour yacht & country club. Gorgeous end unit,with contemporary flair,sweeping views over the river and marina is sold turnkey. Spacious floor-plan,3,790 sf,designer decorated 4 bdrm suites,4. 5 baths & 2 large lanais with river and golf course views elevator opens to your private foyer with gorgeous custom leaded doors. Great-room floor plan with designer finishes, custom draperies,premium lighting fixtures & crown molding throughout. Large custom open kitchen with rich wood cabinetry,granite counters,center island,prep sink ≥ monogram appliances & cook top. Wake up to fantastic river views from your large master suite. Two large walk-in closets with custom built ins. The living/family rooms are separated by a custom wet bar with wine cooler. The paramount features 2 resort pools, billiard,fitness center, beach area with tiki huts along the water & outdoor gas grills. Large private storage room and 2 premium parking spaces are in the enclosed climate controlled garage. Gulf harbour is a private waterfront country club featuring golf,yachting,tennis,fitness center, spa,2 restaurants,close to sanibel. The paramount at the shores in gulf harbour yacht and country club is a premier location in fort myers. Gulf harbour has everything. 18 hole golf course, deep water marina, fabulous tennis center with new sports clubhouse under construction, great restaurants, security, pool and areas to walk and jog. The paramount is a high rise building just at the mouth of the inlet into the world class marina. It offers a private pool, beach, fitness center, security, under building parking with 2 spaces, billiards and community rooms. The unit was professionally decorated with italian marble on the floors and walls. Artisan tiles throughout the kitchen and baths augment the total look of the home. There are 4 bedrooms, all en-suite, 4 and 1/2 baths with 3790 square feet of living area. The lanais overlook the river and marina on one side and the golf course on the other. The kitchen was recently updated with hardwood cabinets and granite countertops and new appliances. There's a private secured elevator directly to the unit where the foyer greets guests to your home. Gulf harbour and the paramount are a hard combination to beat. Call today for a private showing appointment. Stunning wyman stokes former model home with panoramic golf course, lake, & preserve views. Located on a quiet cul-de-sac on the banks of the lake & 9th tee, this well-appointed home is sure to impress. Soaring 20 ft ceilings with beautiful coffered ceilings throughout. Chefs kitchen with high-end gas stainless steel appliances & dining with bay windows overlooking the lake & course. Open living room features 90 degree sliding glass doors & outdoor courtyard with fireplace. Opened up for the ideal entertaining space & evening cross-breeze to blend the lines between indoors & outdoors. 4,644 sf with 4 bedrooms each with en-suite full baths & walk-in closets. Large master suite with incredible views, walk-in closets, jacuzzi tub, & walk through shower. Upstairs billiards game room with full wet bar, large screened balcony, & bedroom. Large patio lanai, summer kitchen with gas grill, travertine deck, gas & solar heated pool with upgraded salt water system. Impact windows, sliders, and electric shutters in back. Shadowood preserve golf & country club is an amenity rich community offering optional golf membership with access to three courses and 54 holes of championship golf.